Close to the door was a basket of corks which struck me as rather kind. 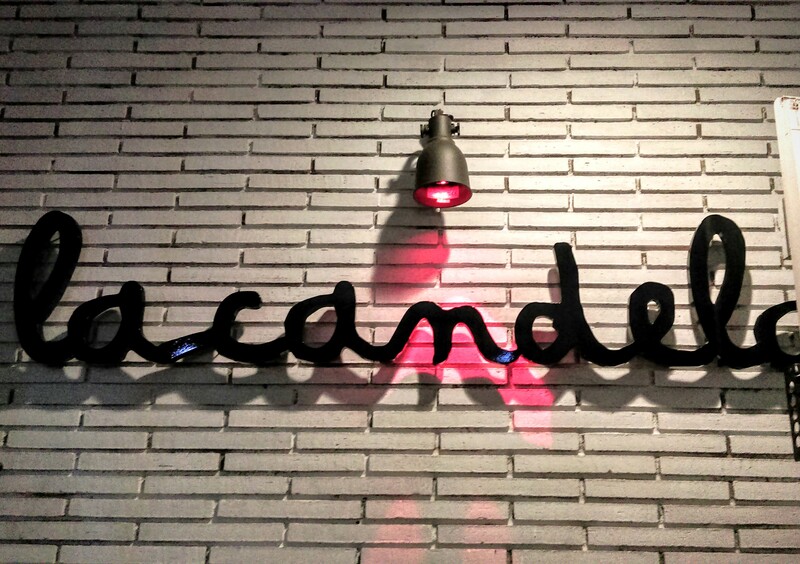 Unlike most restaurants, La Candela clearly appreciates that impulse sometimes gets the better of us and we’ve all been known to order a whole bottle when a glass would have sufficed. They are encouraging responsible drinking and giving you an opportunity to continue enjoying their fine wine at home. During the fifteen or so minute wait for a table we drank vino de tinto (red wine with ice, lemon and soda) which was similar to sangria and very refreshing. We were seated at the bar but soon after a table became free which our waitress offered us. Again this was extremely considerate given there were other people queuing to be seated! We didn’t just move to any old table, but arguably the best table in the house. It wasn’t even really a table, it was actually a rustic wheel from a cart turned on its side and topped with glass; ‘wild west chic’ if you will. There were even decorative objects like vintage grinders on the table which I got a little carried away with (luckily I was advised to stay clear of them before I broke anything). It was the sort of menu that required a strategy (how many dishes from each section), wisdom (what can we have here but nowhere else) and a healthy appetite for risk (foie gras with lime and coffee is rather wacky after all). With the above in mind, we chose five dishes. First was a goat’s cheese salad. 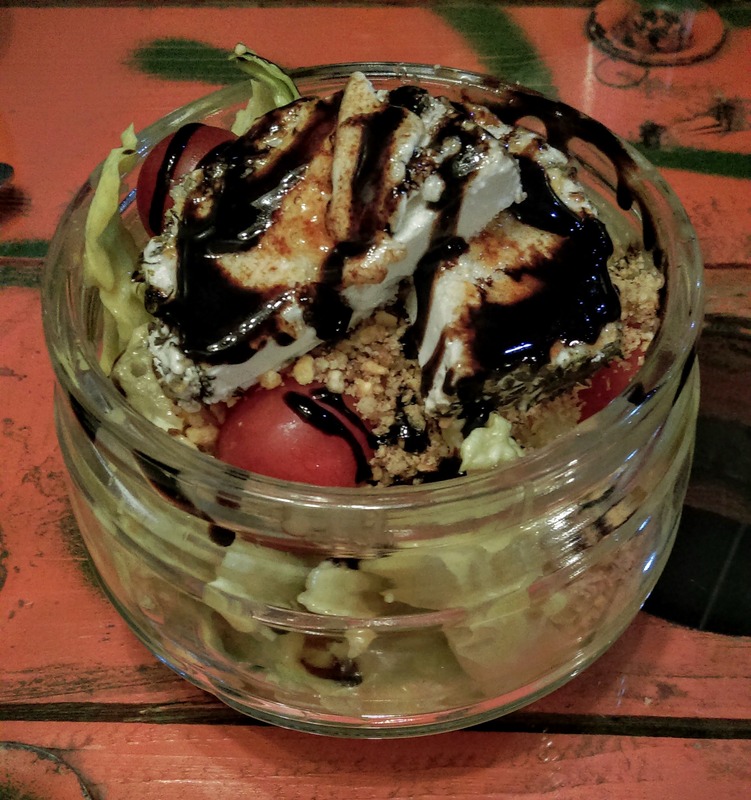 It came neatly packed into a glass pot of lettuce and whole cherry tomatoes in a sharp honey mustard dressing, sitting under two sizeable pieces of goat’s cheese rolled in something tasty on the outside edge and coated in honey and caramelized on one side. For textural variety, chopped nuts and corn were sprinkled on top. 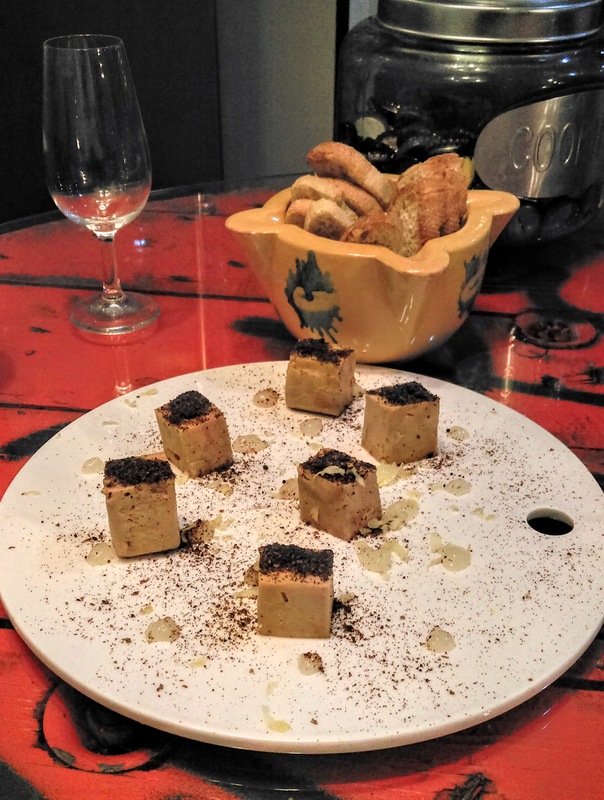 Next was the foie gras with coffee and lime, served on a serenely white board and divided into little cubes spaced out neatly like pillars on a Roman ruin. The lime was infused in the foie gras and in shavings dotted around the plate. As far as I could tell there were only sprinkles of coffee sitting on top of the foie gras so that wasn’t an integral part of the dish. Our third dish was tuna that had been smoked then grilled, served on a seeded crusty granary roll with roasted onions and peppers and raw baby spinach. The tuna was very unlike any tuna I’ve had before, so much so I thought perhaps we had been too confident in our Spanish and ordered pork instead. Luckily it was just an uncharacteristically smoky tuna. Next were veal meatballs. Browned and slightly crispy on the outside but soft and rare inside, bathing in a delicious heart-warming gravy, along with chestnuts and wild mushrooms. Watching the desserts being taken to other people’s tables was like witnessing a big bouquet of flowers being delivered to a colleague, so once the opportunity arose we, or more accurately, I grabbed it with both hands and ordered what was essentially a posh kinder bueno. 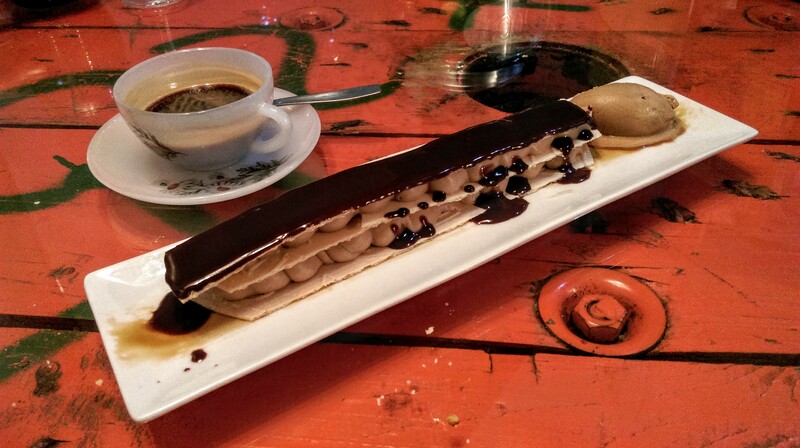 It was a long thin construction with wafer as its foundation, then neatly piped blobs of white chocolate and hazelnut ganache, on top of which sat another wafer adorned with a glossy dark chocolate sauce.